A typical 1000 MWt Fast Neutron Reactor (FNR) is an enclosed cylindrical pool of liquid sodium 21.0 m in diameter X 15.5 m deep. Immersed in center of this pool are numerous bundles of vertical 1.27 cm OD X 6 m steel fuel tubes that, via a passive nuclear process with no moving parts, maintain the pool temperature at a constant 450 degrees C.
Immersed in the liquid sodium around the pool perimeter are heat exchange bundles which extract heat from the liquid sodium pool to make steam for production of electricity and supply of district heat. When there is no thermal load the liquid sodium pool temperature remains at 450 degrees C.
The fuel and heat exchange bundles used in a FNR are road truck portable. A FNR can be made in almost any desired size, although for economic reasons some sizes make more sense than others. If FNRs are made too small economies of scale are lost. If FNRs are made too large energy transmission costs per kWh increase because nearby consumers cannot economically absorb all the electricity and heat produced. For electricity delivery reliability it is usually better for a utility to have multiple smaller power reactors than one large power reactor. If a FNR is assembled from truck portable modules it is known as a Small Modular Fast Neutron Reactor (SM-FNR). SM-FNRs provide the only economic and sustainable means of fully displacing fossil fuels from global energy production, especially in the circumpolar countries. It is not possible to fully displace fossil fuels with renewable energy. Most of the available economic hydroelectric power is already harnessed. There is no economic means of generating, transmitting and storing sufficient intermittent wind and solar energy to reliably meet electric power requirements. In the circumpolar countries such as Canada and Russia there is insufficient sunlight in the winter and there are protracted periods of low wind. Absent abundant local hydro-electric energy storage there is no other non-fossil energy storage technology that can economically meet power and energy requirements during extended low wind and low sun periods. In the circumpolar countries heating is one of the largest energy usage categories. Efficiently meeting the heat load with non-fossil energy requires district heating systems that are fed by Small Modular nuclear Reactors (SMRs). These SMRs should be geographically distributed within urban centers to economically supply both heat and electricity. The Nuclear Option. The public should realize that since about 1980 the fossil fuel industry has spent billions of dollars on publicity campaigns and government lobbying aimed at preserving fossil fuel market share by preventing wider deployment of nuclear energy. In spite of a few widely publicized but relatively minor accidents, nuclear energy has shown itself to be by far the safest and least expensive means of reliable non-fossil bulk electricity production. In the USA there is gradual realization that the US government policy has been politically dominated by fossil fuel industry influence to the detriment of the environment. In 2018 most existing nuclear power reactors are water moderated. The term "water moderated" means that water flows through the core of the reactor and absorbs most of the kinetic energy from energetic neutrons emitted during the fission process before these neutrons are reabsorbed by the fuel. Water moderated power reactors were initially developed for military submarine applications and are primarily fuelled by the relatively rare uranium isotope U-235. However, the mineable U-235 resource is insufficient to permit sustained full displacement of fossil fuels using water moderated reactors. Water moderation has several other distinct disadvantages for land based electric power generation including: high fluid operating pressure, essential continuous coolant pumping, potential void related power instabilities, wasteful use of natural uranium, large scale production of long lived nuclear waste and relatively frequent shutdowns for safety system checking and refuelling. Modern liquid sodium cooled Fast Neutron Reactors (FNRs) avoid these disadvantages by using naturally circulated liquid sodium rather than pumped water for reactor core heat removal. However, the chemical incompatibility of sodium and water make liquid sodium cooled nuclear reactors unsuitable for marine applications. A major advantage of Small Modular liquid sodium cooled Fast Neutron Reactors (SM-FNRs) is that they can be designed for safe unattended operation. If there is loss of control power, loss of thermal or electrical load or loss of coolant pumping the reactor defaults to a safe shutdown state with fisson product decay heat removal by natural convection. If a nuclear reactor's neutron spectrum in its core zone contains mainly neutrons with kinetic energies of the order of 2 MeV it is known as a Fast Neutron Reactor (FNR). If a FNR is cooled with liquid sodium it is known as a liquid sodium cooled FNR. A Small Modular FNR (SM-FNR) is a FNR that is assembled from a collection of factory fabricated and tested modules, each of which is truck portable. The FNR described on this web site is liquid sodium cooled and is assembled from road truck portable modules. Hence on this web site the term FNR implies both liquid sodium cooling and road truck portable modules. sodium = 98 C, tin = 232 C, cadmium = 321 C, lead = 327 C, zinc = 419.5 C, iron = 1538 C and chromium = 1907 C.
The FNRs contemplated on this web site have both core and blanket zones. The core zone is where the nuclear chain reaction takes place. The blanket zone surrounds the core zone and captures excess neutrons emitted by the chain reaction in the core zone. These excess neutrons react with the blanket fuel rod material and via spontaneous nuclear decay reactions form Pu-239, U-233 or H-3. These isotopes are recovered via fuel rod reprocessing and are used to make new FNR core fuel rod material. The H-3 and its decay product He-3 are recovered for use as fusion fuels. The importance of fusion is that in theory it can be used to accelerate the rate of Pu-239 inventory growth required to expand the FNR fleet. The core zone of a FNR has a pancake geometry which gives it a large [(surface area) / (volume)] ratio. In a FNR the dominant cause of neutron loss is neutron diffusion out of the core zone. The neutron diffusion loss rate increases with core zone temperature. In a FNR operating at its setpoint temperature the neutron production rate precisely matches the neutron loss rate. If the core zone temperature drops fission reactions occur to restore the core zone temperature to its set point. If the core zone temperature is above its set point fission reactions stop. Hence a FNR acts to maintain its core zone temperature setpoint. As the FNR fuel ages the core zone pancake thickness is gradually increased to maintain the desired core zone setpoint temperature. 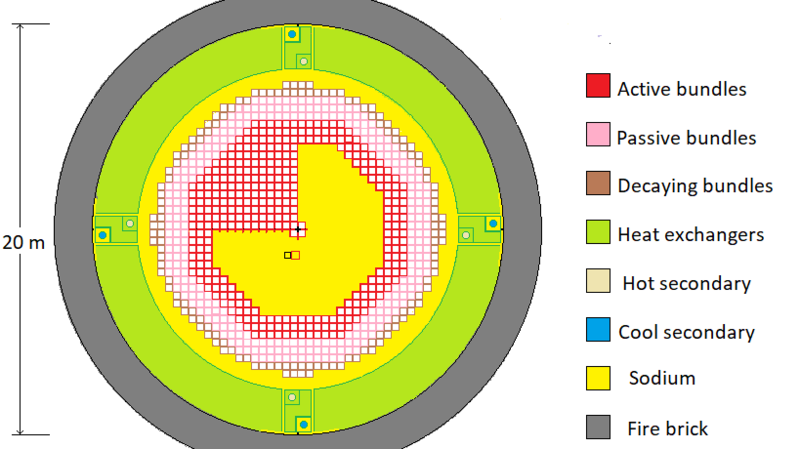 This pancake thickness increase is realized by increasing the insertion of the active fuel bundle control portions into their corresponding active fuel bundle surround portions. Thermal power generation control in a FNR is realized by use of a lower temperature heat sink and controlling the flow rate of liquid sodium between the lower temperature and the core zone temperature. With a FNR thermal power transfer control and electrical power control are achieved by controlling the rate at which a heat transfer fluid moves heat from the liquid sodium pool to a steam generator. A liquid sodium recirculation pump serving the lower portion of each steam generator mitigates thermal stress on the steam generator tubes which contain liquid sodium and are immersed in super heated water. Potential for forming fission fuel U-233 from thorium and fusion fuel H-3 from Li-6. 1) There is a large swimming pool size double wall primary coolant containment tank. 9) A FNR automatically seeks an equilibrium temperature at which the rate of heat generation equals the rate of heat removal. 14) In normal operation reactor temperature is nearly constant. Power reduction is achieved by reducing the intermediate coolant flow rate. 15) A lightly loaded FNR inherently runs at its set point temperature. 16) A distinct advantage of FNRs is that they are almost unaffected by slow neutron poisons. Hence the thermal power of a FNR can ramp quickly to follow a rapidly changing grid electricity load. 17) Cold shutdown of a FNR is achieved by withdrawal of the control portion of the active fuel bundles from the surround portion of the active fuel bundles. 19) After either a hot or cold reactor shutdown there must be sufficient primary and intermediate coolant natural circulation to safely remove fission product decay heat. c) if absorbed by a lithium isotope (Li-6) atom in the blanket yield a mix of tritium (H-3), rare helium isotope (He-3) and common helium (He-4) atoms. d) to harvest H-3 and He-3 atoms for use in fusion power systems. The time between successive fuel reprocessing steps is known as the fuel cycle. During each FNR fuel cycle the Pu fraction in the core fuel decreases from 20% to 12.5% by weight corresponding to 15% core fuel burnup and 7.5% conversion of U into Pu in the core fuel. With U-238 blanket fuel the fuel recycling process yields excess core fuel rod material which enables ongoing expansion of the FNR fleet. With Th-232 blanket fuel the fuel recycling process can sustain the existing FNR fleet but does not allow significant expansion of the FNR fleet. In the above diagram only one quadrant of active fuel bundles is fully populated and only 4 of 32 intermediate heat exchange bundles are shown. A practical 1000 MWt fast neutron reactor used for thermal and electrical power generation is formed from an octagonal assembly of about 547,056 vertical closely spaced 0.500 inch outside diameter closed end steel fuel tubes 6.0 m high X 14.4 m in diameter that is centrally positioned in an upright cylindrical pool of primary liquid sodium 21 m inside diameter by 15.5 m deep. The primary liquid sodium surface is 1 m below the pool deck. The depth from the primary liquid sodium surface to the top of the steel fuel tubes is 6.0 m. There is 2.7 m of primary liquid sodium depth below the bottom of the fuel tubes. This primary sodium pool is lined with stainless steel and is thermally insulated from its surroundings by a 2 m thick layer of fiber ceramic insulation and fire brick. There is a further steel liquid sodium containment layer followed by a 1 m wide ventilated air space stabilized with structural steel which in turn is enclosed by a ~ 1 m thick concrete wall. The concrete wall is externally stabilized by fill embankments of sufficient height, density and dryness to safely contain the liquid sodium even in the event of combined sodium pool and concrete wall structural failures. The sodium pool and its fire brick bottom insulation must be constructed entirely above the maximum possible elevation of the local water table. by natural circulation when there is no electricity. At urban reactor sites these two cooling towers may have the appearance of high rise buildings. The top surface of the primary liquid sodium is covered by steel floats. The purpose of these floats is to minimze the exposed liquid sodium surface area. In the event that air leaks into the reactor enclosure the reduced exposed sodium surface area minimizes spontaneous sodium oxidation and the fire risk. In the middle of the primary sodium pool, poking up through holes in the metal floats, is a grid of 640 vertical steel indicator tubes that project 0.3 m to 1.5 m above the liquid sodium surface. These indicator tubes convey to overhead monitoring and control instrumentation important data relating to active fuel bundle control portion position, active fuel bundle discharge temperature and active fuel bundle gamma ray production. Immersed in the hot liquid sodium around the perimeter of the liquid sodium pool are vertical tube single pass intermediate heat exchange bundles that are used to extract heat from the primary liquid sodium when the reactor is producing heat or are used to add heat to the primary liquid sodium during reactor cold startup or while the reactor is shut down for prolonged service. The isolated heat transfer fluid is non-radioactive intermediate sodium. For safety reasons the intermediate liquid sodium pressure is kept higher than both the primary liquid sodium pressure and the thermal load (steam) pressure. This heat transfer arrangement is safe in the presence of both intermediate heat exchange tube bundle failures and steam generator heat exchange tube bundle failures. There is a gantry crane that is used to reposition fuel tube bundles and to replace intermediate heat exchange tube bundles. There are air-vacuum-argon locks that that used to bring equipment into the reactor space or remove equipment from the reactor space without loss of argon and with minimal mixing air and argon. There are also rotating door type airlocks for personnel entry and exit. These personnel air locks use oxygen absorbing chemicals to minimize the amount of oxygen which enters the reactor space. The argon cover gas above the primary sodium is at atmospheric pressure. Its normal operating temperature is about 450 degrees C. When the reactor is shut down for service this temperature can be lowered to about 120 degrees C provided that sufficient additional argon molecules are added to the cover gas in the reactor building to maintain the 1 atmosphere argon pressure so as to prevent a wall or overhead ceiling collapse. Each FNR has redundant bladder tanks in external silos to accommodate thermal expansion-contraction of the argon cover gas. To the extent possible all work in the reactor enclosure is done using robotic equipment. Any entry by service persons requires both a reactor shutdown and a thermally insulated and cooled suit with a closed circuit breathing apparatus. Such entry may be necessary to replace a defective intermediate heat exchange bundle. The fuel tube assembly is completely surrounded by a ~ 3.0 m thick guard band of high purity liquid sodium. This sodium guard band absorbs all neutrons that escape from the fuel tubes. These absorbed neutrons convert natural sodium (Na-23) into Na-24. The Na-24 naturally decays by electron emission with a half life of 15 hours to become stable Mg-24. In the decay process a 1.389 MeV gamma photon is emitted. After a reactor shutdown it takes about a week for this radiation to drop by a factor of 2000. If any of the fuel tubes are leaking or if the primary sodium purity or filtering is inadequate there could be other radio isotope emissions. For certainty with respect to gamma radiation safety, reactor physical security and sodium containment a FNR is surrounded by a ~ 1 m thick concrete wall. Due to the sodium guard band no neutrons reach the primary sodium pool containment walls, the intermediate heat exchange fuel bundles, the primary sodium pool floor or overhead structures. This prevention of neutron activation and neutron damage outside the fuel bundle assembly enables a long intermediate heat exchanger working life, a very long facility working life and prevents formation of radioactive decommissioning waste. Absence of neutron activation also minimizes the safety complications involved in intermediate heat exchange bundle: alloy selection, repair and replacement. Generally the intermediate heat exchange bundles are fabricated from high nickel steel. The fuel tubes emit heat at a variable rate which keeps the primary liquid sodium in the reactor core zone in the temperature range 440 C to 450 C. The mechanism which controls the fuel tube heat emission rate is thermal expansion of the fuel and liquid sodium. Due to its lower density and hence buoyancy hot liquid sodium naturally rises vertically between the fuel tubes. When the upper 10.8 m of primary liquid sodium reach 450 C with no thermal load the primary sodium natural circulation stops and hence heat production stops. From a thermal engineering perspective a SM-FNR acts as a nearly constant temperature source of flowing primary liquid sodium. The reactor thermal power is controlled by controlling the rate at which heat is extracted from the primary liquid sodium pool. The heat extraction system is designed to limit the maximum heat extraction rate while the reactor is operating to the maximum rated thermal output power of the fuel tubes. Otherwise the core fuel could potentially overheat and melt. Similarly, during a reactor cold start the safe rate of liquid sodium pool warmup is limited by the rated thermal output power of the active fuel tubes. When there is no external thermal load the heat extraction rate is zero. When the top 10.8 m of primary sodium reach 450 degrees C the nuclear chain reaction stops. Hence with no thermal load the primary liquid sodium pool surface temperature stabilizes at 450 degrees C. However, there may still be fission product decay heat. If the primary liquid sodium pool temperature exceeds 455 degrees C heat is rejected via natural circulation and the natural draft cooling towers without any reliance on electrically powered fans or pumps. In FNR core fuel the trans-uranium actinides preferentially fission, instead of simply capturing neutrons as in a water moderated reactor. With appropriate periodic fuel reprocessing a FNR yields about 100 fold more energy per kg of natural uranium than does a heavy water moderated CANDU reactor. During fuel reprocessing the fission products are extracted from the fuel. About 95% of the extracted fission products decay to safe levels in 300 years. Hence on a per kWh basis the rate of FNR long lived spent fuel waste production is about 2000 fold less than for a CANDU reactor. The best method of spent CANDU fuel disposal is to reprocess the spent CANDU fuel into new FNR fuel and then consume it in a FNR. Another important feature of FNRs is efficient electrical load following. Unlike the nearly fixed thermal output of a water moderated nuclear reactor the thermal output of a FNR can be rapidly increased or decreased to follow electricity grid net load changes arising from rapid variations in net load due to intermittent renewable energy generation. In summary, liquid sodium cooled power FNRs can provide sufficient energy to sustainably displace fossil fuels with almost no production of long lived nuclear waste. FNRs can also be used to safely dispose of spent fuel from CANDU and other water moderated nuclear reactors. When a Pu-239 atom absorbs a fast neutron and fissions on average it emits 3.1 fast neutrons. If the probability of other Pu-239 atoms absorbing these fast neutrons and fissioning is greater than (1 / 3.1) then a nuclear chain reaction will occur liberating large numbers of neutrons and a large amount of thermal energy. Otherwise the thermal energy emission by spontaneous fissioning of Pu-239 atoms is extremely small. A 1000 MWt Fast Neutron Reactor (FNR) consists of a pancake shaped core zone 11.2 m diameter X 0.35 m thick containing uniformly distributed U-238 - Pu-239 - Zr alloy core fuel rods sandwiched between two 1.6 m thick blanket zones containing uniformly distributed U-238 - Zr alloy blanket fuel rods. The Pu-239 in the core zone fissions and emits fast neutrons. The U-238 in the core and blanket zones absorbs excess fast neutrons and makes more Pu-239. There is an ongoing flux of fast neutrons flowing from the core zone into the blanket zones. Hence there is ongoing production of Pu-239 in the blanket zones. The Pu-239 concentration in the core zone, the core zone thickness and the blanket zone thicknesses are chosen so that slightly more than (1 / 3.1) of the neutrons emitted by fission of Pu-239 atoms in the core zone are captured by other Pu-239 atoms in the core zone. Hence a chain reaction occurs because the probability of an emitted neutron being captured by a Pu-239 atom is slightly greater than (1 / 3.1). In the core zone the rate of loss of Pu-239 by fissioning is partially offset by the rate of production of Pu-239 via neutron capture by U-238. Reactor criticality at the desired operating temperature is maintained through the operating life of fuel bundles via small incremental changes in fuel bundle geometry. These geometry changes are accomplished by using a liquid sodium hydraulic actuator to change the vertical overlap between each active fuel bundle control portion and its corresponding surround portion. If due to nuclear heat release the temperature of the materials increases, thermal expansion of the materials in three dimensions causes the fraction of fission neutrons diffusing from the core zone into the blanket zones to increase, decreasing the probability of Pu-239 atoms in the core zone capturing fission neutrons. Hence the nuclear chain reaction stops. Liquid sodium has an unusually high thermal coefficient of expansion (TCE) which enhances this effect. An increase in primary liquid sodium temperature above the chosen temperature setpoint will reduce the primary liquid sodium density which will turn the chain reaction off. A subsequent decrease in primary liquid sodium temperature below the temperature setpoint will increase the primary liquid sodium density causing restart of the nuclear chain reaction. The TCE of the other reactor core materials is smaller than for sodium but further contributes to this effect. Hence, subject to an appropriate fuel mix and geometry, a liquid sodium pool type FNR automatically maintains the core zone temperature of the liquid sodium at the chosen temperature setpoint. 273.7 s, which is less than 5 minutes. Thus the thermal mass of the sodium prevents the fuel tubes from being exposed to thermal shock relating to very rapid changes in net electricity grid load. However, the intermediate sodium loop components are exposed to thermal expansion and contraction related to following rapid changes in net grid electricity load. Hence the heat exchange tubes in both the intermediate heat exchanger and the steam generator are made from Inconel. Each active fuel bundle has a vertically sliding portion known as its control portion and has a liquid sodium hydraulic insertion/withdrawal actuator. This arrangement provides a means for incremental control of the fuel bundle's liquid sodium discharge temperature set point. The reactor thermal power is set by the rate of extraction of heat from the primary liquid sodium pool. This heat extraction rate is a function of the difference between the secondary liquid sodium supply temperature and the thermal load temperature as well as the secondary liquid sodium flow rate. The maximum rate of heat extraction must be kept within reactor fuel tube assembly design limits. Otherwise the reactor fuel tubes could overheat. The pressure in each steam generator is controlled by a motorized steam discharge valve which in normal operation maintains a constant pressure (11.2 MPa) in the steam generator. That pressure, via the pressure-temperature relationship for saturated steam, determines the water temperature in the steam generator (320 C). The difference between the liquid sodium primary discharge temperature and the water temperature in the steam generator, less two heat exchange wall temperature drops, determines the change in temperature across the intermediate sodium loop. Thus controlling the intermediate liquid sodium flow rate controls the flow of constant temperature steam delivered to the corresponding turbo-generator. The elevation of the steam generators is at least 10 m above the intermediate heat exchangers to provide sufficient natural circulation of the intermediate liquid sodium for fission product decay heat rejection when the intermediate sodium induction pumps are not energized. The steam discharged from the steam generators is ducted to turbogenerators located underneath the steam generator space. The steam generator space is fitted with rupture panels which in the event of sodium-water contact will vent the resulting hydrogen to the atmosphere. If there is a step change in FNR fuel bundle geometry the fission rate and hence the fission gamma photon flux and the prompt neutron flux respond almost instantly. However, the liquid sodium temperature, which limits the fission power, takes longer to respond. To prevent uncontrolled explosive power growth FNRs must always remain subcritical with respect to prompt fission neutrons, which constitute about 99.8% of the total neutron flux. The remaining 0.2% of the total neutron flux consists of delayed neutrons from fission fragments emitted approximately 3 seconds after the corresponding nuclear fission. Provided that most of the delayed neutrons participate in reactor power control, the rate of fission power growth is safely limited by the rate of delayed neutron production. This time delay in reactor power growth normally allows sufficient time for the liquid sodium temperature to rise and suppress the core reactivity to safely control the fission power in a FNR. There is a requirement that during a cold startup the insertion rate of the active fuel bundle control portion used to ajust each active fuel bundle's discharge temperature setpoint must be sufficiently low to prevent fuel rod melting and to prevent the FNR fuel bundle becoming critical on prompt neutrons. This insertion rate limit is ensured via flow orifices on the hydraulic actuator positioning valves as well as by programmed actuator position slew rate limits. Hence the insertion of the active fuel bundle control portion into the active fuel bundle surround portion is very slow and is very carefully controlled. By contrast on loss of control power the withdrawal rate of the active fuel bundle control portions is very fast. To enable fast active fuel bundle control portion withdrawal a parallel connected full port hydraulic actuator drain valve is used to achieve rapid fuel bundle cold shutdown. The hydraulic control valves must be rated for continuous use with liquid sodium at the highest possible liquid sodium operating temperature. To achieve the required temperature isolation these valves should be argon pressure actuated. On loss of argon pressure gravity should cause the full port drain valve to open. The argon pressure to each actuator drain valve is controlled by an electronic transducer located in a cool environment outside the reactor space. When the reactor is at ful rated power liquid sodium coolant enters the bottom of a FNR fuel tube bundles at about 340 C, flows upwards through the flow channels between the active fuel tubes, and emerges from the top of the active tube bundles at 440 C. The operating temperature setpoint of each active fuel bundle is controlled by the amount of active fuel bundle control portion insertion into the active fuel bundle surround portion. Withdrawing an active fuel bundle control portion from its active fuel bundle surround portion reduces the active fuel bundle discharge temperature setpoint. The low density hot liquid sodium rises to the top surface of the liquid sodium pool, flows across the top of the liquid sodium pool and at the pool edges is cooled by the intermediate heat exchange bundles, causing the circulating primary sodium to increase in density and sink to the bottom of the primary sodium pool. This cooler higher density primary liquid sodium flows along the bottom of the primary liquid sodium pool to a point underneath the reactor fuel tube bundles and then rises again through the reactor fuel tube bundles. The FNR geometry is chosen so that about (1 / 3) of the fission neutrons are absorbed by plutonium in the core zone to sustain the nuclear chain reaction and the remaining (2 / 3) of the fission neutrons are absorbed by U-238 located in both the core and blanket zones for the purpose of breeding more Pu-239 for future use. A small fraction of the fission neutrons are absorbed by steel in the fuel tube assembly and by liquid sodium. As the fuel bundle and sodium temperatures rise up to the fuel bundle temperature setpoint the material densities decrease allowing a larger fraction of fission neutrons to escape from the core zone into the adjacent blanket zones, which turns off the nuclear chain reaction. Similarly, as the fuel bundle and sodium temperatures fall below the fuel bundle temperature setpoint the material densities increase confining a larger fraction of the emitted neutrons in the core zone, which turns on the nuclear chain reaction. If the reactor's external heat load is less than the reactor thermal power output the excess heat is absorbed by the liquid sodium causing the liquid sodium temperature outside the fuel bundle assembly to increase, reducing the primary sodium natural circulation which turns off the chain reaction and hence causes the reactor's thermal power output to drop to zero. If an external heat load removes heat from the liquid sodium the liquid sodium temperature outside the fuel bundle decreases which restarts primary liquid sodium natural circulation and hence the nuclear chain reaction restarts. The core zone runs at a constant temperature of 440 C to 450 C. The rate of heat extraction from the core zone varies with the elevation of the liquid sodium thermal stratification layer. Thus when the active fuel bundle control portions are correctly positioned the FNR thermal power output automatically varies to meet the external thermal load. As FNR fuel ages its core zone plutonium concentration gradually decreases and its core zone concentration of neutron absorbing fission products gradually increases. Compensation for these long term changes is achieved by fine adjustment of the positions of the active fuel bundle control portions with respect to their surround portions to maintain a full load fuel bundle discharge temperature of 440 degrees C.
Full withdrawal of the active fuel bundle control portions causes a total shutdown of fission chain reactions regardless of the liquid sodium temperature. Almost all of the neutrons that are not consumed by the fission chain reaction convert U-238 to U-239 which via two spontaneous electron emissions soon converts to Pu-239. Periodically the fuel rods from both the core and the blanket zones are reprocessed to extract fission products. Then the fission product mass extracted from core fuel rods is replaced by an equal mass of new core rod alloy obtained by reprocessing blanket rod material. Then the consumed blanket rod material is replaced by an equal mass of new depleted U-238. The extracted fission products should be safely stored in isolation for about 300 years to allow their radio toxicity to naturally decay to below the level of natural uranium. The reactor fuel tube assembly for a 1000 MWt FNR consists of 640 active fuel tube bundles surrounded by 252 passive fuel tube bundles. Each fuel tube bundle is 0.4 m long X 0.4 m wide X 6.0 m high. It has a 3 m long lower leg extension and a 3 m high chimney which give it a total height of 12 m. Thus the entire fuel bundle assembly is 12 m high and about 14.4 m in diameter. The individual fuel bundles are sufficiently rugged for both structural and transportation purposes. Each fuel bundle is composed of vertical 0.5 inch OD steel tubes X .065 inch wall, 6.0 m high that form a square lattice spaced (5/8) inch center to center. These steel fuel tubes are closed at both ends and contain the reactor core and blanket rods as well as internal liquid sodium to enhance thermal contact between the fuel rods and the steel tubes and to chemically absorb corrosive fission product gases such as F, Cl, Br and I. Each active tube bundle contains 476 X 0.5 inch OD HT-9 steel tubes. Each passive fuel bundle contains 556 0.5 inch OD HT-9 steel tubes. Hence each 1000 MWt reactor contains 444,752 fuel tubes. The tube to tube spacing is maintained by horizontal (1 / 16) inch diameter steel rods. The tube lattice bottom spacing is fixed by the fuel bundle bottom gratings which support and position the fuel tubes and which permit vertical liquid sodium coolant flow. Some fuel tubes are missing from the lattice to allow for bundle structural steel elements. Each active fuel tube contains 3 X .533 m long blanket fuel rods, 1 X .35 m long core fuel rod and then another 3 X 0.533 m long blanket fuel rods. Each passive fuel tube contains 7 X .533 m long blanket fuel rods. During prolonged reactor operation the core fuel rods swell from 0.35 m long to about 0.400 m long. Each fuel tube contains a measured amount of liquid sodium. The top 2.4 m of each active fuel tube are nominally empty to provide sufficient plenum volume to relieve pressure stress resulting from formation of inert gas fission products and to store sufficient spare sodium to compensate for fuel tube material swelling. The plenum tube length also serves as a flow guide to enhance primary liquid sodium natural circulation. Each fuel tube bundle is supported and stabilized by a 12 inch X 12 inch square steel support pipe. The vertical insertion/withdrawal of each active fuel bundle control portion is controlled by liquid sodium pressure applied to a piston type hydraulic actuator located inside the square support pipe. The control portion's vertical position is indicated by a closed end vertical indicator tube attached to the top of the control portion. This indicator tube projects above the surface of the liquid sodium. At the bottom inside of the indicator tube is a mercury pool that maintains a mercury vapor pressure inside the indicator tube corresponding to the liquid sodium temperature at the bottom of the indicator tube. This temperature is the fuel bundle's liquid sodium discharge temperature. This temperature is indicated by a coiled Bourdon tube mounted on the top plug of the indicator tube. The Bourdon tube moves a mirror that changes the angle of reflection of a scanning laser beam. The core fuel rods are initially by weight: 10% zirconium; 20% plutonium, U-235 and fissionable transuranium actinides; and 70% U-238. The blanket rods are initially by weight: 10% zirconium and 90% U-238. The purpose of the zirconium in both the core and blanket rods is to prevent plutonium from forming a low melting point eutectic with the steel fuel tube material. The square fuel bundle support pipe is welded to the steel frame resting on the bottom of the liquid sodium pool. This steel frame positions and stabilizes the fuel bundles. Hydraulic pressure lines routed through the frame and the square steel support pipes provide the controlled liquid sodium pressure that raises or lowers each active fuel bundle control portion. The active fuel bundle control portion actuators are periodically automatically cycled to ensure that none of them stick. Heat is removed from the fuel tube assembly by primary liquid sodium which flows upwards via natural convection through the fuel tube support gratings and then up through the gaps between the HT-9 steel fuel tubes. The support gratings are fitted with bottom filters to trap any particles with dimensions over (1 / 32) inch. There is space behind the filters to allow for liquid sodium cross flow so as to ensure liquid sodium flow past all the active fuel tubes even if a particular filter is partially obstructed. It is necessary to maintain the FNR near the threshold of fission criticality. This constraint in combination with the fuel geometry sets the nominal core zone thickness with new fuel at 0.35 m. As the fuel ages and the fuel swells the core zone height gradually increases to about 0.40 m.
The reactor core zone maximum outside diameter is a function of the liquid sodium pool inside diameter. That diameter is constrained by practical structural issues related to reactor roof construction. With an 11.2 m diameter reactor core zone the sodium pool inside diameter is 21.0 m . It is necessary to have a roof covered 4 m wide perimeter strip around the liquid sodium pool for the insulating brick, maintenance access and air cooling, and gamma ray absorbing concrete. Hence the reactor building outside diameter is 29 m.
The reactor core zone height, the fuel tube assembly diameter and the fuel tube geometry establish the active heat transfer area of the fuel tubes. There is also a heat transfer limit relating to the rate at which liquid sodium will naturally circulate between the fuel tubes. At FNR core zone diameters smaller than 11.2 m the economies of scale related to the required liquid sodium pool volume are reduced. At FNR core zone diameters greater than 11.2 m the FNR enclosure cost quickly rises due to the length of the unsupported roof span. During reactor operation there is ongoing fission in the core zone so the core zone acts as a source of neutrons. During reactor operation the blanket zones act as net neutron sinks. As the reactor runs there is a gradual accumulation of fission products, primarily in the core fuel rods. Neutrons emitted by fission of Pu-239 are absorbed by U-238 in both the core and the blanket rods. The resulting U-239 spontaneously converts via Np-239 into Pu-239 within about one week. Further neutron absorption by Pu-239 that does not fission causes formation of Pu-240. This Pu-240 spontaneouly decays in a manner which prevents FNR fuel from being used for atom bomb production. After an active fuel bundle has operated for some time (~ 40 years) the accumulated fission products in the core fuel rods and the decrease in Pu-239 concentration reduce the core zones' reactivity. In addition the fuel tubes may swell reducing the primary liquid sodium flow. The fuel tube bundle is then moved to the perimeter zone of the liquid sodium pool for 5 to 10 years to allow dissipation of short lived fission product decay heat. Over a fuel cycle period of about 40 years the active and passive fuel bundles are gradually replaced at staggered intervals and the fuel bundle material is reprocessed and recycled. After fission product decay heat dissipation the tube bundles are removed from the liquid sodium pool and transported to a reprocessing facility where the fuel tubes are extracted and disassembled. The fuel tube material, the core rods, the blanket rods, the liquid sodium wwithin the fuel tubes and the sodium salts are each reprocessed differently. The fuel reprocessing involves successive selective removal of sodium and sodium salts, selective removal of uranium, selective extraction of fission products from the high atomic weight elements, selective extraction of zirconium from the low atomic weight elements and reforming the remaining fuel rod residue into new core rods. The selectively removed uranium plus some new U-238 is formed into new blanket rods. New steel tube bundles are assembled and the entire FNR fuel cycle process is repeated. The steel tubes are formed from an iron-12% chromium alloy known as HT-9 that has a low nickel and low carbon content. The fuel tube material recycling process involves selective titanium and chromium extraction. Due to neutron activation of the fuel bundle materials the fuel reprocessing is carried out by robotic equipment. The reprocessing of the used fuel rods and blanket rods yields more Pu-239 and trans-uranium actinides than the FNR needs. Hence the excess Pu-239 and actinide inventory can be accumulated and used to start another FNR. A major constraint on the rate of implementation of liquid sodium cooled FNRs is the available supply of FNR start fuel containing 20% (plutonium plus actinides). This start fuel may be obtained by reprocessing spent water cooled reactor fuel or by plutonium breeding by FNRs. It may take as much as 200 years for one FNR to breed enough surplus plutonium to start another identical FNR. Thus in the near term the maximum rate of FNR deployment will be primarily a function of the available supply of spent water cooled reactor fuel. It appears that due to the FNR start fuel constraint the world will have to live with a mixed fleet of water cooled reactors and FNRs for at least the next century. In liquid sodium cooled Fast Neutron Reactors (FNRs) the thermal power output is proportional to the fast neutron flux incident upon the fuel, as compared to water moderated thermal neutron nuclear reactors in which the thermal power output is proportional to the slow neutron flux incident upon the fuel. For safe power control Fast Neutron Reactors rely on thermal expansion to reduce each fuel bundle's reactivity as its core zone temperature increases. The vertically sliding active fuel bundle control portion positions are adjusted so that all the active fuel bundles operate at the same discharge temperature. These vertically sliding active fuel bundle control portions are also used to achieve a reactor cold shutdown. One of the issues in FNR design is ensuring that no matter what adverse circumstances occur in an emergency gravity will cause the active fuel bundle control portions to fall into a safe cold shutdown position. 1. The argon cover gas above the FNR liquid sodium surface is at atmospheric pressure. Apart from the fuel tubes components subject to pressure stress are not subject to either excitation or material degradation due to the neutron flux. 2. High pressure steam and hydrogen can be safely vented to the atmosphere because they never contain radioactive isotopes. 3. The FNR radio isotope containment system never has to deal with high steam pressures, condensation or hydrogen production. 8.The greatly reduced cooling water requirement of an FNR reduces its impact on marine ecology. 9. Due to the reduced requirement for cooling water a FNR can be sited much further above the local water table and surrounding bodies of water than a direct water cooled reactor, thus enhancing system safety in rare but severe events such as floods, earthquakes, hurricanes, meteorite strikes, tsunamis, etc. 11. In a liquid sodium cooled FNR the structural components such as the sodium pool walls and the heat exchangers are not exposed to the neutron flux, enabling a facility service life of hundreds of years rather than just 60 years as with a CANDU reactor. The intermediate sodium flow velocity within the intermediate heat exchange tubes is chosen to minimize heat exchange tube internal erosion while maintaining a sufficiently turbulent liquid sodium flow for good heat transfer. 12. The long reactor service life and the liquid sodium guard band minimize the rate of formation of radioactive decommissioning waste. 14. The steel components of a FNR that are exposed to a high neutron flux are replaced and recycled at the same time as the reactor fuel. Part of the iron is transmuted into chromium. 16. Unlike water cooled and moderated reactors a liquid sodium cooled FNR does not produce high pressure radioactive steam. Hence a FNR does not need a pressure rated enclosure for radioactive steam containment. If the pressure in the steam generator gets too high the steam can be safely vented to the atmosphere because it is not radio active. The liquid sodium pool must enormously over heat before the sodium vapor pressure becomes structurally significant. 17. A major non-obvious advantage of FNRs is a nearly infinite fuel supply. Since a FNR consumes natural uranium at less than 1% of the consumption rate of a water moderated reactor an FNR can economically utilize natural uranium resouces that have very low uranium concentrations. That feature greatly increases the total available natural uranium resource. 18. The scientific issues related to FNRs have been well understood since the late 1960s. The practical metallurgy issues were resolved by about 1990. There is no valid reason for failure to deploy FNRs. 19. SM-FNRs are assembled from modules. All the modules are replaceable. There is no practical limit to the working life of a properly designed SM-FNR facility. A disadvantage of a liquid sodium cooled FNR is that the sodium reacts violently on contact with water and above 200 degrees C sodium burns in air. For fire safety the liquid sodium pool of a FNR requires both a floating steel cover and an argon gas cover. Each FNR should have an on-site cryogenic argon production facility. The liquid sodium pool of a FNR must be located above the highest possible future water flood level. Hence usually FNRs reject heat to the environment by air cooling rather than by water cooling. In district heating systems surplus heat can be rejected via roof-top fan-coil units at customer owned premises. Liquid sodium cooled FNRs are inherently unsuitable for marine applications. Local fire department personnel must be trained to NEVER use water to fight a fire in a FNR facility. A preferred extinguishing agent is Na2CO3. A significant security issue with FNRs is that they operate with a large Pu-239 inventory. During FNR operation first-in first-out fuel bundle replacement should be followed to maintain a sufficient Pu-240 concentration in the fuel that the Pu-239 cannot be selectively chemically extracted and used to fabricate fission bombs. Since FNRs are not located near large bodies of water they require adjacent small (< 10% of reactor capacity) natural draft dry cooling towers for reliable rejection of fission product decay heat. In normal operation the FNR heat output is absorbed by a district heating system. In an urban environment excess heat can be rejected by rooftop mounted fan-coil units distributed across a city. 5. Achieve a fast neutron reactor fuel composition that meets the required performance and safety requirements. The concept of recycling spent CANDU fuel through a fast neutron reactor was originally developed by Professor Peter Ottensmeyer and a group of students at the University of Toronto. The process relies on a chemical/mechanical process that first selectively extracts UO2 from spent CANDU fuel, then makes the residue metallic and then separates low atomic weight atoms (fission products) from high atomic weight atoms (remaining uranium, plutonium and trans-uranium actinides). The low atomic weight atoms are placed in isolated storage where over 300 years their radio toxicity naturally decays to below the level of natural uranium. Then, subject to selective Se-79 and Sn-126 chemical extraction, this low atomic weight waste can either be recycled or buried in existing depleted uranium mines. The weight of the fission product atoms removed from the core fuel is replaced by an equal weight of transuranium actinides extracted from the spent CANDU fuel inventory. New core rods and blanket rods are fabricated and then run through a fast neutron reactor. This fuel cycle is repeated over and over again until the entire inventory of spent CANDU fuel is exhausted. It is estimated that during each fuel cycle about 15% of the core fuel rod weight will be converted from high atomic weight atoms to low atomic weight atoms. It is estimated that the Ottensmeyer Plan realizes more than 100 fold more energy per kg of mined natural uranium than does the present CANDU fuel cycle that operates with natural uranium in a slow neutron environment with no fuel recycling. Hence the existing inventory of spent CANDU fuel should be sufficient to power Canadian Fast Neutron Reactors for centuries to come. During each fuel cycle sufficient Pu-239 is produced to sustain the reactor reactivity during the following fuel cycle and to provide yet more Pu-239 for starting other FNRs. A storage facility comparable to the Jersey-Emerald mine is needed to securely store the fission products for about three centuries and to store a small fraction of long lived nuclear waste for about one million years. Obstacles to immediate implementation of FNRs are political resistance to transportation, storage and processing of material derived from spent CANDU nuclear fuel bundles. The spent fuel, instead of gradually diminishing in radioactivity as the years pass, would be chemically and mechanically reprocessed and reused about every 50 years. Hence on-going access to a secure naturally dry spent fuel storage facility, such as the Jersey-Emerald mine complex in British Columbia, is an important part of FNR implementation. It is contemplated that the initial FNR fuel reprocessing site would be at Chalk River, Ontario, which is far from any urban center. Ideally the fission product storage facility should be located close to the fuel rod reprocessing facility. One of the lessons to be learned from experience in France is that if the fuel reprocessing facility is not properly located highly radioactive materials wind up being transported to and fro across the country. Another potential site for a fuel rod processing facility is Trail, British Columbia where the local population has for generations been accustomed to large scale management of highly toxic mine waste. Once all of the reprocessing issues related to the spent fuel bundles have been resolved there is no obvious reason why analogous techniques could not also be applied to recycling the medium level nuclear waste that OPG currently contemplates burying in yet another deep geological repository. 1) A CANDU reactor takes about 1.5 years to convert 1% of its fuel weight into fission products. 2) One fuel cycle time is the time period between successive reprocessing of FNR fuel bundles. During one ~ 22.5 year fuel cycle time a FNR converts about 15% of its core fuel weight into fission products. 3) Based on different FNR designs the fuel cycle time may vary from as low as 10 years to as high as 50 years. depending upon the FNR design. However, if most of this reactor capacity is to be inherently safe reactors with natural circulation of primary coolant the Pu-239 doubling time will be of the order of 200 years. Even if the public accepts the danger of living adjacent to power reactors that rely on high differential pumped coolant circulation the Pu-239 doubling time will be at least 50 years. 1) Presently there is no recognition by either the Canadian or US governments that the Pu-239 shortage will threaten the very existence of the human species in the years to come. Without sufficient Pu-239 there is no sustainable substitute for fossil fuels. 2) Making Pu-239 from U-235 requires consumption of one atom of U-235 for every 1.5 atoms of Pu-239 produced. It takes about 30X as much natural uranium to fuel a U-235 based FNR as it does to fuel a CANDU reactor of similar thermal output capacity. Hence just to replace existing thermal reactor capacity with breeder reactor capacity requires natural uranium sufficient for about 45 years of present water moderated reactor operation. 3) If we contemplate quadrupling the the world nuclear reactor capacity over the next 40 years using breeder reactors to achieve sustainability we are committing the entire known mineable natural uranium resource. If we fail to do this as fossil fuels are exhausted there will be no energy left but renewable energy. 4) The only strategy that can mitigate these problems is conservation of Pu-239 and U-235. Consuming Pu-239 in water moderated reactors or burying spent water moderated reactor fuel containing these isotopes in the ground is worse than stupid. 5) All the new reactor designs that do not net breed new fuel should simply be discarded as a waste of critical resources. The regulatory authorities should do all necessary to to accelerate approval and funding of new breeder reactor designs. 6) From an electricity market perspective all new breeder reactor capacity should have the highest priority for electricity grid access. The existing market models will just have to be changed to make that happen. The high school core curriculum should have a section that discusses the crucial role of Pu-239 in future energy production and that sufficient Pu-239 will not exist unless breeder reactors are both funded and operated today irrespective of present natural gas prices. 7) The above observations are dictated by the laws of physics. There are all kinds of ridiculous claims based on market models that have no foundation in physical reality. The human species as we now know it will live or die in accordance with the natural physical laws. 8) There is a possibility of harvesting natural uranium from the oceans. However, the concentration of uranium in sea water is only about 3 paarts per billion so the recovery cost is very high. Possibly there might be some marine life species that naturally concentrates uranium in the ocean. A blunt reality that humans must face is that fossil hydrocarbons must remain in the ground. Sustainable production of reliable non-fossil power requires fast neutron power reactors. Fast neutron power reactors initially require about 20% Pu in their core fuel rods to operate. Hence any treaty, legislation or regulation that only permits lower fractions of Pu in nuclear fuel is not compatible. The important issue in prevention of nuclear non-proliferation is maintaining a sufficient Pu-240 to Pu-239 ratio in the fuel to prevent the plutonium being suitable for making fission bombs. This ratio is maintained by doing all necessary to ensure that FNR fuel bundles are irradiated in a first in-first out sequence. In the USA a 20 MWe fully functional prototype liquid sodium cooled FNR known as the EBR-2 was built and successfully operated from about 1964 to 1994. Under the Bill Clinton administration the USA took a huge step backwards when it cancelled funding of its fast neutron reactor program. In Russia a 600 MWe fully functional prototype liquid sodium cooled FNR known as the BN600 was built and successfully operated from about 1984 to 2016. See 600 MWe LIQUID SODIUM COOLED POWER REACTOR. Today the Russians also have an 800 MWe FNR and are working on a 1200 MWe FNR. Realistically, as compared to North America, the Russians have a 30 year lead in FNR technology. This lead is a direct result of fossil fuel industry led corruption of the US and Canadian governments. 1. The components of a FNR that are exposed to a high neutron flux are routinely replaced and recycled along with the reactor fuel. 2. A major issue in practical liquid sodium cooled FNR operation is complete exclusion of water and air. The reactor cover gas is argon. At high sodium temperatures exposure to the atmosphere or water will cause a spontaneous fire. 3. A significant security issue with liquid sodium cooled FNRs is that they operate with a large plutonium inventory. At every stage of reactor fuel handling appropriate measures must be taken to ensure that the ratio of Pu-240 to Pu-239 is sufficiently large to prevent the plutonium being suitable for use in atom bombs. 4. A significant limitation on the rate of deployment of FNRs is the time required for one FNR to breed enough plutonium to start another identical FNR. This period is known as the plutonium doubling time. 5. The scientific issues related to FNRs are well understood. However, there is relatively little practical power FNR operating experience. North American electricity utilities presently have no pressing financial motivation to adopt FNRs.